AgeCare SkyPointe is a publicly funded continuing care community offering high quality, compassionate, resident-centred care including Designated Supportive Living (SL4), Designated Supportive Living Dementia Care (SL4D) and Long-Term Care (LTC). All residents are admitted through referrals from the Alberta Health Services. 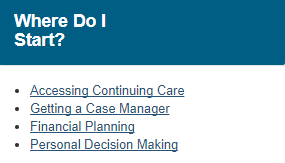 To begin the process, please visit the Alberta Health Services Continuing Care “Where Do I Start” section of their website.